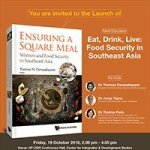 The UP CIDS Program on Social and Political Change, together with World Scientific Publishing (Singapore) and the UP Department of Political Science, is co-organizing the launch of and a panel discussion on the book “Ensuring a Square Meal: Women and Food Security in Southeast Asia” on October 19, 2018 (Friday), 2:00 to 4:00 PM, at the UP CIDS Conference Hall. The UP Center for Integrative Studies (UPCIDS) Programs on Alternative Development, and Social and Political Change, together with the UP Department of Political Science will be holding a roundtable discussion on the book “Islamic Populism in Indonesia and the Middle East,” on 21 October 2017, 10:00 a.m. onwards at the UP Center for Integrative and Development Studies, Lower Ground Floor, Bahay ng Alumni, UP Diliman. The discussion is free and open to the public, but seating will be on a first-come, first-served basis. 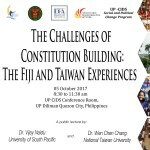 The UP Department of Political Science, International IDEA, Constitution Transformation Network, and the UP-Center for Integrative and Development Studies Social and Political Change Program invite you to a forum entitled “The Challenges of Constitution Building: The Fiji and Taiwan Experience” on Thursday, October 5, 2017, from 8:30 am to 10:00 am at the UP-CIDS Conference Room located at the Lower Ground Floor of Ang Bahay ng Alumni at UP Diliman. Dr. Naidu Vijay from the University of South Pacific, Fiji and Dr. Wen Chen Chang from the National Taiwan University will be giving lectures on the subject.